All dog owners will know that once a pet finds the perfect spot on your bed, they’re not willing to give it up. Nope, not even if you drop a load of cash on the fanciest dog bed you can find. They’re not budging. 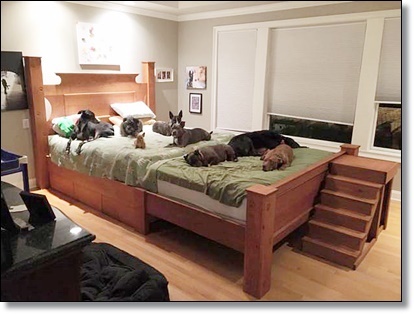 After months of struggle to sleep comfortably with all eight of their dogs in one bed, one couple came up with a creative solution. 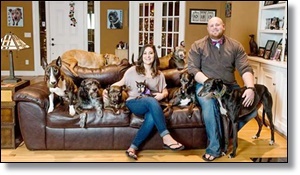 Chris and Mariesa Hughes are the couple behind The Mr. Mo Project, a senior dog rescue that places senior and sick dogs in foster homes. They have eight dogs of their own, and were struggling to get a proper night’s sleep with all of the dogs trying to fit in one bed. So they had a local craftsman build them a giant mega-bed, with plenty of space for themselves and all eight dogs. Chris told metro.co.uk: “When we go to bed, all of the dogs try to beat us there and take up all the space on the bed. We didn’t want to allow one dog and not the other so we would manage and often times wake up needing a hip replacement. The couple hired Michael, who runs Michael’s Custom Interiors, to create the bed, which is fourteen feet long and seven feet wide. 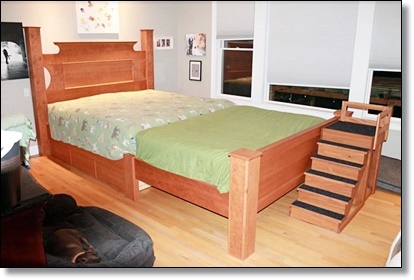 The bed takes two mattresses and is twice the size of your average king-size. 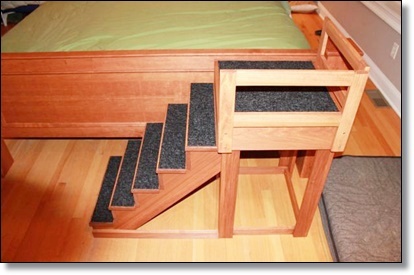 It also features under-bed storage, plus a little set of stairs for the dogs who have trouble jumping up on to the bed. “We are sleeping very well,’ said Chris. 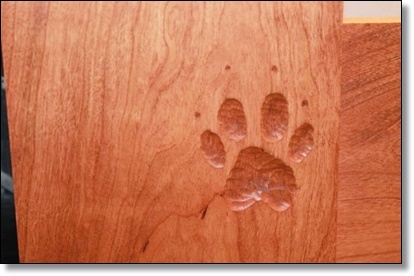 “Each one of the dogs has his or her spot and it makes it easy now. Gremlin will sleep up at the top of the bed with us and often use one of our pillows. Stig will wait until the light goes off and then jump up with Mariesa and lay under the covers next to her. Sammy likes to sleep at the bottom of the bed under the covers until he gets too hot and then he moves on top of the covers. “Tejas is the only dog that likes his space so he usually sleeps on one of the many decorative dog beds on the floor. Mabel will start out sleeping next to Chris under the covers but because she only weighs 3 pounds we move her to a pack and play next to the bed so she doesn’t get stepped on. This is great news. They really need a good night’s sleep to be able take care of the dogs. The bed is now big enough to accommodate a few new pups, if Chris and Mariesa end up adopting more.